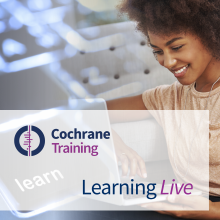 This webinar is the first in a series of Knowledge Translation (KT) “The view from here” webinars that share experiences, challenges and good practice from people across the Cochrane community about their KT activities. This webinar looks at how to develop and evaluate a KT plan based on the advice and experiences from the Cochrane Child Health Field. Sarah Elliott and Gabrielle Zimmermann will introduce Cochrane Child Health in the context of their previous KT activities, and discuss their creation of a KT plan based on the Field’s work to date and their future course. Their plan was developed by mapping out a new direction using Cochrane’s KT framework. Sarah and Gabrielle with present the detail of this exercise, including any challenges and considerations. They will then consider how this type of KT plan could be evaluated and set up for success. Finally, they will consider how this approach might be used by other Cochrane Groups and the possible challenges, considerations and opportunities. At the end of the webinar, there will be time for questions and feedback. The presenters are especially keen to hear suggestions from attendees on what the Cochrane community would find useful with regard to carrying out planning exercises. Sarah Elliott is the Program Manager for Cochrane Child Health, based at the Alberta Research Centre for Health Evidence. She has over seven years' health research and project management experience in pediatric nutrition. Through her postgraduate studies and research fellowships she has been involved in numerous projects encompassing different aspects of pediatric clinical and public health research. An advocate for evidence based practice, she understands the need for (and translation of) high quality evidence to improve health practices in both pediatric clinical and community settings. Combining her expertise and interests she hopes to develop accessible tools to support the translation and uptake of evidence to clinicians and health policy makers. Gabrielle Zimmermann is the Program Coordinator – Knowledge Translation & Implementation Science with the Alberta SPOR SUPPORT Unit Knowledge Translation Platform. She has wide-ranging experience in research and Knowledge Translation (KT) that encompasses the knowledge to action cycle; from creating and synthesizing evidence to facilitating the implementation of evidence into practice. Her experience includes critical appraisal of evidence, integrated KT proposals and end-of-grant KT plans. Gabrielle is an Adjunct Assistant Professor with the Department of Community Health Sciences at the University of Calgary.